The HM-457 Asphalt Pavement Analyzer Junior (APA Jr.) is a multi-functional two-wheel Asphalt Wheel Tracker to determine rutting, fatigue cracking and moisture susceptibility of hot or cold asphalt paving mixes in dry or submerged conditions. This versatile CE-approved model from Pavement Technology has a small footprint and meets all requirements for the AASHTO T324 Hamburg Wheel Tracking Test and AASHTO T340 Rut Test. 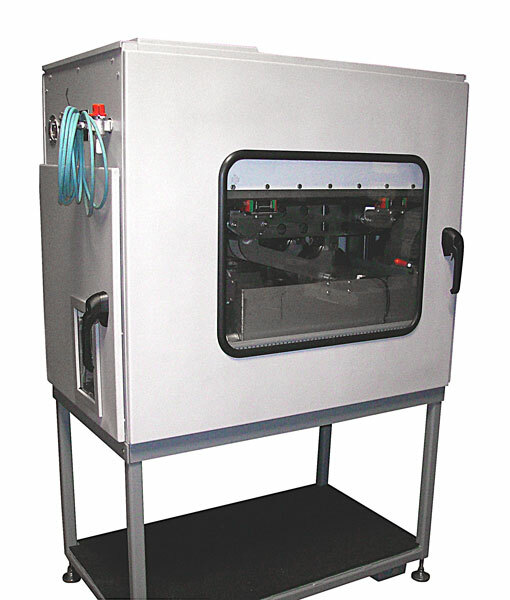 The HM-457 can also be equipped to perform a variety of other tests, including high contact pressure testing for airport runways and taxiways, microsurfacing/slurry seal testing and low-temperature fatigue and studded wheel tests with the optional Chiller. 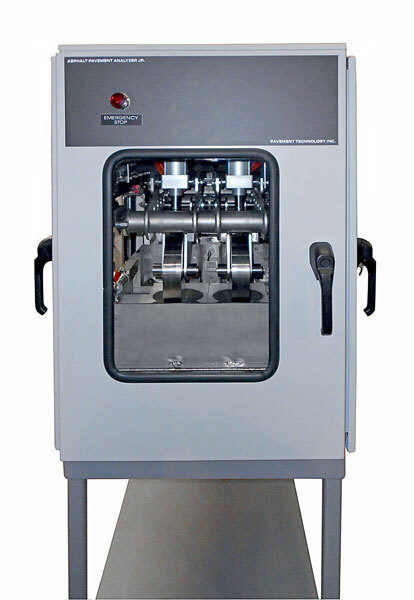 The unique frequency drive of the APA Jr. allows mixes to be tested at multiple speeds and loading rates. 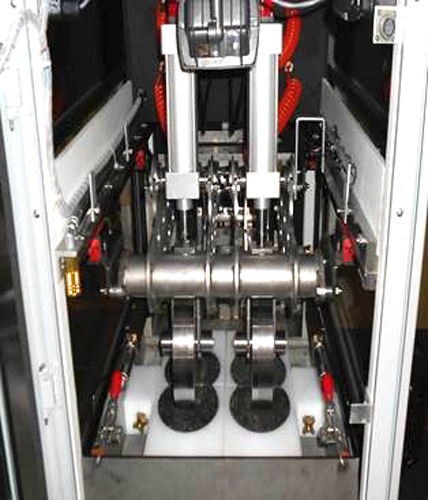 A sample holding assembly precisely positions the specimens in molds under the wheels for testing. A series of heating elements and the optional Chiller regulate heating and cooling of the main chamber, controlling temperatures from -9° to 80°C (15° to 176°F). A 15gal (57L) stainless steel water tank circulates temperature controlled water to the reservoir, which maintains water levels about 1/2in over specimens during the test. Temperature can be maintained up to 80°C (176°F). Vertical measurements are determined using linear position transducers and rut depth is monitored with transducers mounted inside the pneumatic cylinders. The APA Jr. is equipped with a PLC-based control system, operated through the user’s laptop or PC, to maintain all calibration and operational functions. Data is plotted and displayed in numeric and graphical format. Five or more measurements on a beam and three or more on a cylindrical specimen are collected in each pass and the data is calculated to 0.00001mm. The wheel tracking assembly operates from 0 to 60 cycles (120 passes) per minute, with stroke and speed adjustable for Hamburg Testing. Wheel loading is applied through independent pneumatic cylinders. Four cylindrical molds of ultra-high molecular weight (UHMW) plastic are provided with the APA Jr., two 150x62mm Dia.xH for Hamburg Tests and two 150x75mm Dia.xH for Rut and Moisture Damage Tests. 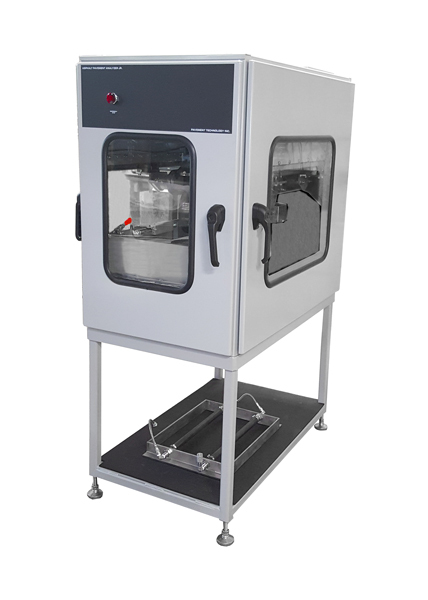 The molds can accommodate Gyratory, Marshall, Hveem or core specimens. Two Hamburg-type wheels and two APA concave wheels, each constructed of stainless steel are included with high-pressure hoses. Additional beam-type molds and wheels for studded wheel, slurry seal and fatigue tests are also available. A source of clean, dry compressed air at 120psi (8.3bar) and 8CFM (226LPM) is required. Electrical requirements are 208 or 230V/50-60Hz, 40A single phase. Slurry Seal / Microsurfacing Testing Kit for APA Jr.